The Husqvarna 12527HV Dual Stage Snow Blower is a step up from the likes of the Husqvarna 924HV Snow Blower or the Husqvarna 924SB Snow Blower. You can probably guess from the name that this dual stage snow thrower has a clearing width of 0.69 m (27 inches). 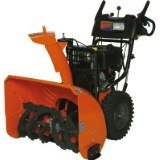 It’s powered by a very robust LCT engine that gives the snow blower 12.4 ft-lbs of torque. This engine is a 4 stroke (meaning that you never have to mix fuel and oil yourself). The displacement of the engine is 0.29 liters. Power is transferred to the wheels of the 12527HV via a chain drive transmission. What’s particularly cool and useful about the two stage Husqvarna 12527HV snow blower is that it has power steering which makes operating this machine in slippy conditions like on ice and compacted snow relatively easy. This is helped greatly by the fact that it uses X Trac tires for grip. These tires have a width of 0.13 m (5 inches) and a diameter of 0.41 m (16 inches). These are X Trac wheels which provide superior grip. The intake height of the 12727 HV snow blower is quite high at 23 inches allowing it to take on very deep snow. The auger used on the Husqvarna 12527HV Snow Blower has a diameter of 0.3 m (12 inches) and chops the snow, no matter how compacted into small easy to manage pieces. The auger is made from serrated steel. This snow is then expelled through the chute by the impeller. This is a pretty large impeller than has a diameter of 0.3 m (12 inches) and is also made from steel. The rotation of the chute is controlled from the operator station for extra efficiency. There is also a chute deflector at the top of the chute that gives the operator more accuracy as to where exactly he is sending the snow. This is also operated from the operators station. Click Here to buy the Husqvarna 12527HV Snow Blower.